Over the years I have seen, heard and read so many myths about Lime Sulphur (sometimes spelt as Lime Sulfur). Why there is so much invention, misinformation and almost mystique surrounding this chemical I am not sure, but it seems to stem from less-informed bonsai literature of yesteryear. Lime Sulphur is a foul-smelling liquid that bonsai enthusiasts brush onto deadwood in order to produce a distinctive white colour. It does not paint a coat of colour onto the wood, but rather as the lime sulphur dries, it 'bleaches' or 'stains' the wood with a white, chalky colour. Lime Sulphur was originally developed as a winter wash (fungicide and insecticide) and used to spray trees during the Winter to kill any residual moulds, fungi and overwintering insects or eggs. It was first developed during the mid 19th century to control mildews on grapevines in French vineyards. From the early 1900's to the 1940's, lime sulphur was used widely and produced on a commercial basis until it was superceded by newer, more efficient chemicals. How does Lime Sulphur stain the wood of a tree? The Lime Sulphur mixture produces a certain amount of Sulphur dioxide (SO2) as it dries (dependent on the ambient temperature, the warmer Lime Sulphur solution is as it dries, the greater the volume of Sulphur Dioxide that is produced). Sulphur dioxide is a known preservative still used in the wine-making and dried-fruits industries where it is used for its ability to kill microbes and bacteria. Sulphur dioxide is also known as a reductant; that is, in the presence of water, it is able to 'decolourise'/remove the colours of permeable materials that it comes into contact with (Sulphur dioxide is still used in some industries to bleach paper and delicate fabrics such as clothes). The bleaching effect of Sulphur dioxide is not permanent however, after exposure to oxygen (in the air), the bleached material is slowly oxidised and the natural, original colour or pigment of the stained material returns. 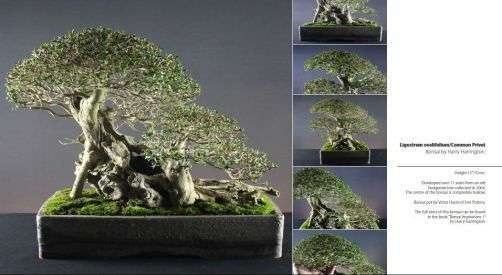 This is one of the reasons why Lime Sulphur must be repeatedly applied to the deadwood of bonsai to ensure it stays white. Lime-sulphur isn't a pleasant liquid. Without doubt it should be treated with respect. Wear gloves when applying it. Store it out of reach of children. Wear a face mask if you use it as a spray. If you swallow any solution or get any in your eyes, seek medical assistance. Where do you obtain Lime Sulphur? Lime sulphur is virtually impossible to obtain at general horticultural outlets as it has long been superceded by other insecticides, fungicides and winter washes. These days, the only place you will find Lime Sulphur liquid is at Bonsai nurseries or online through Bonsai mail order companies. It is a relatively cheap product and a small bottle will last a long time. I have only ever seen one authoritative guide to producing your own Lime Sulphur that involves boiling calcium hydroxide and sulphur and allowing it to simmer for a few hours .Given the cost of obtaining the ingredients, the danger of this process and the fact that it is extremely smelly, it is not worth trying to produce your own lime sulphur! Together with your lime-sulphur, you will require a separate dish. Pour a small amount of the lime-sulphur solution into the dish or container. Do not apply the lime sulphur directly from the bottle as it will spoil the mixture. You need to use a covered or old surface to work on as the lime sulphur can splash and flick as you apply it to the deadwood.The lime sulphur will stain almost anything that it comes into contact with. You must work outside. Lime sulphur is very pungent until it dries, do not apply it indoors! Use a paintbrush to apply the lime sulphur to the deadwood. The exact size of brush you require will depend on the size and intricacy of the deadwood but generally an old paintbrush of 1cm or less is required. It is worth finding some old artist's paintbrushes if possible; I find that the bristles of cheap brushes tend to disintegrate quickly with the combined effects of the rough deadwood surface and the effect of the lime sulphur on the glue used to attach the bristles. Otherwise you can spend a lot of time carefully removing bristles from the deadwood! The brush can be cleaned with soapy water if done so immediately after use. However, if allowed to dry, the lime sulphur will render the brush unusable. Lastly, have some absorbent paper cloth (kitchen roll/tissue) at hand to absorb spills and excess Lime sulphur on the deadwood. This is a Juniper trunk that has recently had its bark removed to create a shari. The live vein of growth is on the right hand side of the trunk and its edge has been sealed with wound sealant for the purposes of helping the edge of the live wood heal. It is not necessary to protect the live wood, bark or cambium (even when green) against the lime sulphur. The tree will not be damaged even if the live green cambium layer is exposed to lime sulphur. It does not matter whether the deadwood is fresh and has just been created (from live wood) or has been 'allowed to dry for a while'. You will find that new deadwood is slightly sappy and the lime sulphur will not take quite as well as it does when the deadwood is older, but again, it is not necessary to wait after creating deadwood before applying lime sulphur.